Beautiful Secluded & Private Four Bedroom Villa With Private Pool In Coral Bay. Private & secluded four bedroom three bathroom villa with private pool, very conveniently located in a private cul-de-sac within a short walk of the center of Coral Bay where guests will find a wide selection of restaurants and cafes, including Chinese, Italian, Tex-Mex, Sushi, and traditional cuisine. There is also a choice of supermarkets for fresh groceries in Coral Bay and within a short walk away who will deliver your shopping to the villa. The public sandy beach of Coral Bay, which offers various water sports, a cafeteria restaurant, and sunbeds and umbrellas, is also just a 5 minute walk away. Spacious modern air conditioned interior with open plan lounge and dining areas and modern fully fitted kitchen. The living area offers wireless internet access, android satellite TV, Hi-Fi whilst the kitchen is fully equipped and includes a microwave, oven, coffee machine, dishwasher and fridge/freezer. Two twin bedrooms with adjacent full sized shower room. Two spacious bedrooms with access to the shaded outdoor balcony with lounge seating facilities. The master double bedroom offers en-suite facilities and the second bedroom is a twin bedroom and there is also a family bathroom located on this floor. Exceptionally well maintained private grounds offering a 5m X 10m private pool with roman steps, a shaded outdoor lounge area, a shaded outdoor dining area, barbecue, and a complete set of outdoor furniture including sunbeds and umbrellas for 8 persons. Complete privacy in a very pleasant and convenient location. The villa offers complete privacy in the heart of Coral Bay and is located within a 5 minute walk to the main strip. We have taken every step necessary to ensure that the villa is in an exceptional condition and our guests enjoy their stay here. Two bathrooms are en-suite to the bedrooms and one is on the ground floor (bathtub with shower head) and the other two are on the first floor and have shower cubicles. Air conditioning throughout the villa included in the rental rates. Pool and beach towels are provided. Modern fully fitted kitchen with cooker/oven, dishwasher, microwave, and all utensils. Exceptionally well maintained mature grounds. First floor balcony with shaded outdoor lounge area. Outdoor terrace/dining area overlooking the pool. Private 5m X 10 m pool with walk-in steps. Notes on accommodation: This villa will appeal to guests who seek a luxury villa with a large and spacious private pool area and who do not necessarily wish to hire a car. This villa is very highly recommended. Outside: Full collection of outdoor furniture overlooking the private pool including 8 sunbeds, umbrellas, outdoor dining area, and all in complete privacy. Cleaning / Towels / Linen / Maid service: Linen and towels are provided and the villa is cleaned once per week. The villa was perfect for my family. The location was very central. The villa had everything we needed and more. Excellent holiday destination. We will going again next year. Unfortunately we received no instructions on how to get in or disable the alarm we did send off out ETA and group names and numbers so we arrived expecting to be greeted by a member of the company.as a result we where stood outside for two hours in the blazing sun !! Had I not had Maria's number then we would have been in trouble thankfully she was an angel and sorted things out for us very quickly. Other than that it is a lovely villa and our stay was brilliant. Absolutely lovely villa, perfect location. Lovely spacious villa. Well manicured garden and beautiful pool. BBQ area and lovely terraces and balcony. Perfect location: 10 minutes walk up to the main Coral Bay strip where there is an excellent selection of bars and restaurants. Just a few minutes walk to the sandy beach of Coral Bay. Regular buses to Paphos town and just a 10 min journey up to Corallia Beach: buses 1 euro 50 one way or 5 euros all day! Fridge was stocked with some basics and housekeeping came in and cleaned. Pool was serviced most days. I would thoroughly recommend this villa and the company. They were all very helpful. The country house is just remarkable! We had a rest all family with two children of 10 and 12 years from 05.10.16 - 12.10.16. It was a best rest in our life! The country house is just remarkable, there is everything for rest for every taste. The arrangement is the best: 3 minutes on foot to the beach (we did not see such pure and transparent water anywhere though we had a rest in Dominican Republic, Thailand, Vietnam, Spain, Montenegro), 5 to the shops, cafe and restorants. In the house it is very pure, the kitchen is perfectly equipped, it is a pleasure to cook to children food. The excellent pool, is a lot of greens in the territory. We dreamed of queit family rest and were very satisfied. We would like to arrive here next year! Villa perfect and provided for all our needs. Loads of sun beds and chairs by the pool. Clean and every electronic convenience you would need. Perhaps could do with some bbq utensils which were really the only things missing but that's a very minor point. Would recommend to friends. The sandy beach of Coral Bay is less than a 5 minute walk away! Here, guests will find a cafe, sunbeds on the sea front, and various water sports. Paphos International Airport is located 25km from the villa or about 25 min drive. Upon your arrival, if you would like a taxi to collect you at the airport, we will send a trustworthy local taxi driver to collect you and he will have the keys to the villa for you. Alternatively, if you hire a car for your holiday, I can recommend a close friend who will give you a good deal on car hire. The villa is located in the heart of Coral Bay and is within a short walk of banks, restaurants, tavernas, cafes, bars, and shops as well as the sandy beach of Coral Bay. Paphos International Airport is 20km away, and the nearest large town is Paphos which is located less than 10 minutes by car and has a large selection of shops, restaurants and a good night-life. 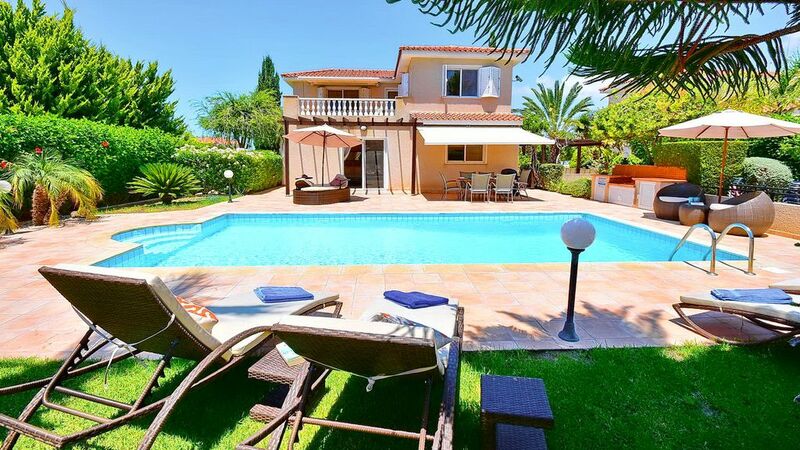 This villa is ideal for both first time visitors to Cyprus as well as guests who do not necessarily wish to hire a car. We have taken every care to ensure that guests at the villa will enjoy their stay. The property is exceptionally well maintained and is equipped with the view towards making sure that comfort and convenience are offered. The villa will appeal to both small and larger groups who enjoy completely private villa holidays and who may not necessarily wish to hire a car. Booking Notes: If you would like to reserve the villa pending your search for suitable flights we would be happy to take the property off the market for you for a period of 3 days. To secure a villa booking, we ask for a down payment of 30% and the balance 8 weeks prior to arrival. Payment can be made to us via bank transfer within the UK and through any of the major credit/debit cards via PayPal. Changeover Day: Flexible. Notes on prices: Please note that the rental rates are inclusive of the use of air-conditioning in the bedrooms and the lounge and dining areas and there are no added or otherwise associated costs to the villa hire of any nature. Complimentary WI FI is also available.